We had just canoed and hiked around Atsena Otie Key, just off Cedar Key, Florida. 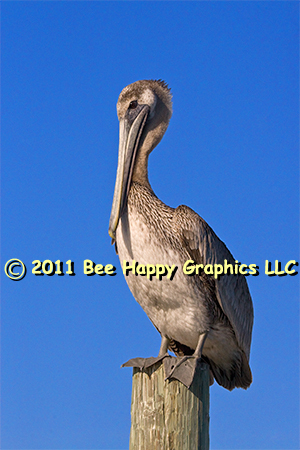 This pelican was waiting for us when we returned. Since it posed so beautifully, Nancy just had to take its picture. 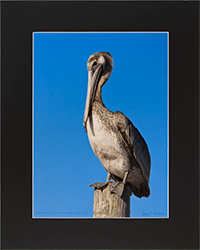 By their third year, brown pelicans (Pelecanus occidentalis) develop a white neck and blackish belly. Photographic details: Canon EOS 30D camera w/ EF 100-400mm f/4.5-5.6L IS USM lens set at 210mm. Flash was not used. Camera was on f/16 for 1/1250 sec (Shutter Priority) at ISO 800. Fine Art Paper 16" x 12" 18" x 131/2"
Canvas N/A 24" x 18"